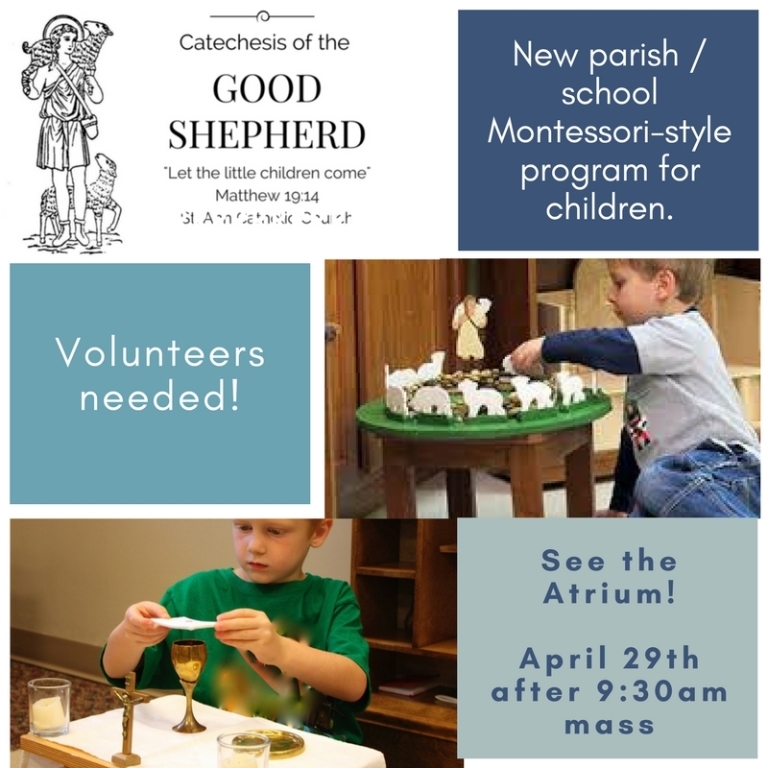 Montessori-style Catechesis of the Good Shepherd atrium program for children ages 3-6yrs old. This BEAUTIFUL program helps children fall in love with Jesus, the Good Shepherd, through use of beautifully made, hands-on materials presented to them in a carefully prepared, quiet environment. Almost like offering spiritual direction for children, this approach helps give an opening for them to see God’s goodness and offer their own responses in reaction and prayer. Jesus, our Good Shepherd, bless our atrium. Make it a place where children can open their hearts to you. May they grow in love for you, and never want to live apart from you. Jesus, our Good Shepherd, who truly knows His children each by name, aid our parish in every way that this endeavor may be pleasing to you. Lord you said, “Let the little children come to me.” May the children of our community open their hearts to you, their Good Shepherd, and grow in their desire to know, love and serve you. Heavenly Father, you designed families to have parents who would love their children and lead them in your ways. Inspire in the hearts of parents here in our community a desire to put you at the heart of their home. Lord, as we seek to offer Catechesis of the Good Shepherd to your flock, we know we need more hands. Please send your Holy Spirit to inspire more volunteers to aid in offering this opportunity to our youngest disciples. Good Shepherd, we believe that in the atrium you are the true teacher. Call forth and inspire those who can be trained to serve as catechists in the atrium. Good Shepherd, so often you speak to your young ones in the silence of the atrium. Help us to find Assistants who can be a helpful presence to the children and aid in cultivating the silence of the atrium. Father, you created a world full of beauty that inspires wonder and awe. Help us to find people who sew, paint, woodwork and others who can use their talents to create beautiful materials that will inspire wonder and awe in the atrium. Jesus, the heart of this ministry is to help your children fall in love with you, their Good Shepherd. May all who are associated with this ministry powerfully feel your great love for them, and in turn have their hearts set on fire with a burning love for you. Father, you know well the plans you have for each of your children. In the experience of the atrium, may seeds for vocations be planted and grow. Lord, the Catechesis of the Good Shepherd helps your presence be known. May this ministry foster renewal in the hearts of all those touched so that it spills over to contribute to a renewal of our parish, as well.